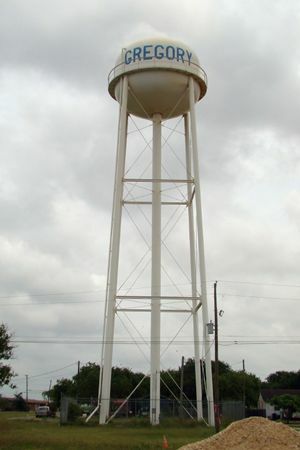 The Coleman-Fulton Pasture Company and the San Antonio and Aransas Pass Railway partnered to build the town - which was named after U.S. attorney general Thomas Watt Gregory. 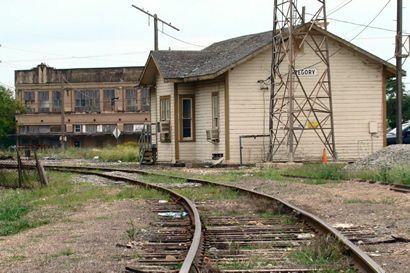 The location was to be the point on the railroad where the rails split to go to Corpus Christi. 1900: McKamey opened a bank. 1909: Hotel Green is built - one of the finest hotels on the coast. President Taft visits the Coleman Fulton Ranch. 1920s: Gregory declined when company offices move to Taft. 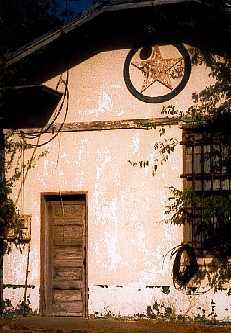 The hotel moved to Taft in 1922. 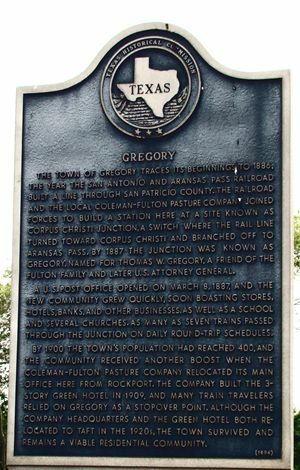 The town of Gregory traces its beginnings to 1886, the year the San Antonio and Aransas Pass railroad built a line through San Patricio County. The railroad and the local Coleman-Fulton pasture company joined forces to build a station here at a site known as Corpus Christi junction, a switch where the rail line turned toward Corpus Christi and branched off to Aransas Pass. By 1887 the junction was known as Gregory, named for Thomas W. Gregory, a friend of the Fulton Family and later U.S. attorney general. A U.S. Post Office opened on March 8, 1887, and the new community grew quickly, soon boasting stores, hotels, banks, and other businesses, as well as a school and several churches. As many as seven trains passed through the junction on daily round-trip schedules. By 1900 the town's population had reached 400, and the community received another boost when the Coleman-Fulton Pasture Company relocated its main office here from Rockport. The company built the 3-story green hotel in 1909, and many train travelers relied on Gregory as a stopover point. Although the company headquarters and the Green Hotel both relocated to taft in the 1920's, the town survived and remains a viable residential community. Gregory high school (now part of Portland-Gregory ISD) is where country music legend Don Williams went to school. Williams was raised here and sings about his childhood there in the song Good ol' Boys Like Me. "The smell of cape jasmine through the window screen. I can still hear the soft southern winds in the live oak trees."